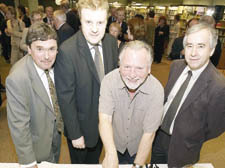 Barry Cropper, Assistant Director Art Galleries and Support Services at City of London, Steen Quilter, Chairman of Libraries, Archives and Guildhall Art Gallery, City of London, Kenneth Cranham, actor and John Lake, Barbican Librarian. I BUMPED into actor Kenneth Cranham at the Barbican Library’s 25th birthday party on Monday where he was cutting a birthday cake to mark the occasion. It turns out that Kenneth, who starred recently as Pompey in the BBC hit Rome, is a big fan of the library. He used it to research a film he made about the poet WH Auden for BBC 4 earlier this year called The Addictions of Sin. Unfortunately, he told me it did not attract a huge amount of attention – but it did have one notable fan. “I was on the bendy bus not long after it was on TV and Alan Bennett got on,” he told me. “I could see that he wanted to talk to me but I was at the front of the bus and he was at the back. So I fought my way through and he told me that he’d loved the film. That made my day. n Rare historic BBC recordings of WH Auden reading his own poems have just been released by the British Library to commemorate the centenary of Auden’s birth. POLITICS can be a cruel game. While the council is preparing to honour Roy Shaw, who is the longest serving councillor at the Town Hall, the question arises whether he received sufficient deserved recognition by central government. Lesser local politicians have been hoisted high by No 10 Downing Street in recent years. It was shortly after the publication of the Queen’s honours three or four years ago that Roy confided his dark thoughts to me in a Town Hall corridor. Roy, now 81, told me how he had driven tanks during the war and had also been involved with the intelligence corps. Later in the 50s – at the height of the Cold War – he had been involved with left-wing Labour MPs who had formed trading companies which, in turn, sometimes traded with East Germany and Russia. On one occasion he had travelled to East Germany on business. Later, as he rose high in local government and was often spotted by Labour cabinet ministers in the 70s, he met an old intelligence friend – who sounded a bit like Smiley in one of John Le Carre’s novels. From the whispered conversation, it seems Roy’s card had been marked by his visit to East Germany. Honours at some level would come his way, but not what, in other circumstances, he would have achieved, such as a peerage. Or so his old friend made clear. And all unfairly because a more patriotic man could not be found among Labour’s ranks. “I’m afraid that’s what happened,” Roy told me that day at the Town Hall while we were discussing an ennoblement that had found its way to a colleague of his. IT’S not easy being a celebrity these days. Amiable impressionist Jon Culshaw paid a visit to his Hampstead hairdresser’s two weeks ago – and found himself roped into judging the deli next door’s charity Easter Egg competition. HAMPSTEAD-based writer Deborah Moggach is currently hard at work on a drama about former Westminster council leader Dame Shirley Porter. CONGRATULATIONS to chief executive Andrew Way of the Royal Free who appears to have acted on a complaint aired in my column the other week about parking fines imposed on medical staff. After I had described how a doctor had been fined for parking in the hospital grounds while on emergency call over the weekend, it seems as if Mr Way has taken up the case with the firm Parkforce that runs parking at the Free. According to my source he has asked Parkforce to cancel the charge. A sensible intervention by the chief. A BEGGING letter has come my way that touches near heights of hysteria from Labour’s national office urging a lapsed member to rejoin the party. “I’m going to get straight to the point – I want you to rejoin the Labour Party,” the letter from membership organiser Rob Henderson pleads. A frantic Henderson is probably looking down the abyss where he can see how the membership has fallen from 400,000 in 1997 to around 200,000 today. “I know we may have asked you to come back before, but now because it is more important than ever for the party to be strong, I’m asking you one more time,” the letter goes on. “So, you might wonder, how I’m going to persuade you,” asks Henderson. He asks whether he could tell my contact about all the new hospitals built by Labour. And then in anticipation of the reply, asks: “No? Have you got children? Then I could tell you all about family tax credits.” Which he proceeds to do. Oddly enough, he never once mentions Tony Blair in the letter. A name that is out of bounds in view of the Iraq tragedy? Playing a wonderful CD the other day of an Israeli-Arab orchestra conducted by the great Daniel Barrenboim, I came across a better interpretation of politics by Barrenboim in his notes to the piece.